our trip today is filed under TDM2014 *and* one-day-trip. 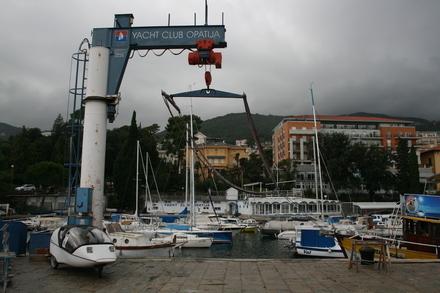 we start in trieste and circumvent the istrian pensinsula and arrive back in triest. we have three learnings for today. 3. ads with pictures of croatian coastlines that look unreal and photoshopped are *NOT* photoshopped and unreal: what you see is what you get! note: this will be a long entry! note2: if you get the chance – absolutely do it yourself! 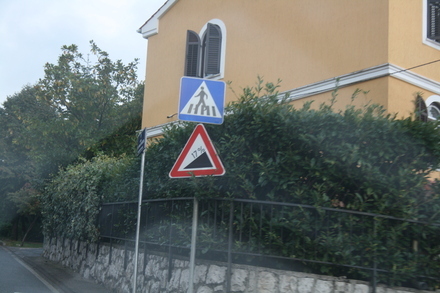 the coastal road takes us towards slovenia and gives us a chance to cruise lazily along with virtually no steep hills in between. 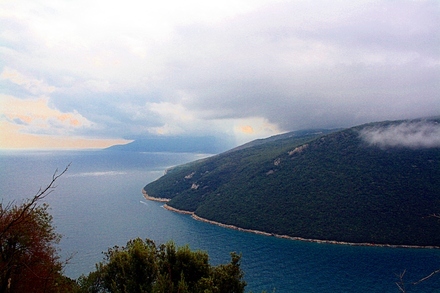 the distance to croatia from here is just a few dozen kilometres – just a few very nice old coastal cities. 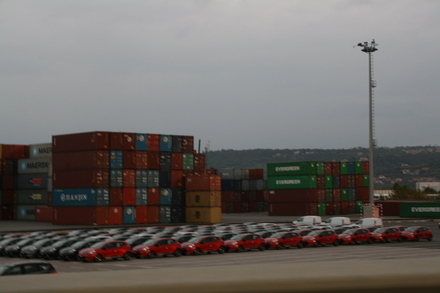 since this slim part of slovenia has access to the sea, there are two large commercial ports – we see many, many cars ready for import – none of them electric, though! 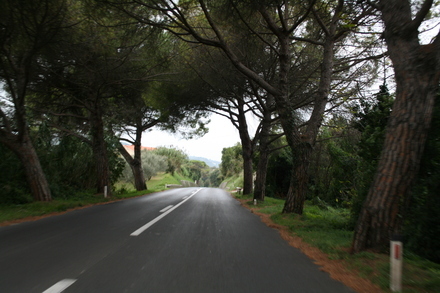 trees and vegetation are decidedly mediterranean here: pine trees, olive trees and arid patches are the norm – we like driving along the pine tree alleys! 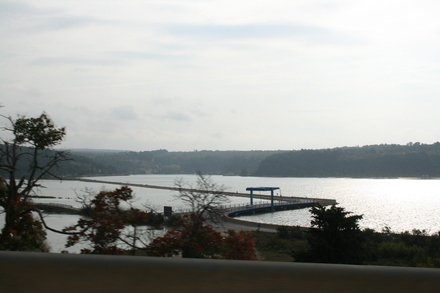 40 mins later, we arrive at the croatian border: schengen ends here. we europeans are no longer used to stop at borders and have our passports checked. 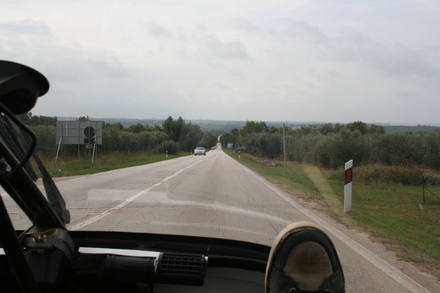 with no fuss at all and some very interested border control officers asking us some questions, we enter croatia. we get some kuna, the local currency, and a piping hot coffee to start our trip in croatia. 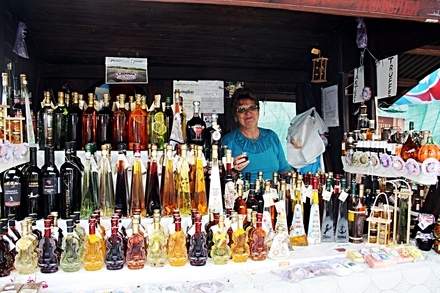 croatia’s wine is well known in the balkan region, i can even get it in my cooperative shop in the village i live in. the countryside is dominated by this industry and tourism. one in five cars has german number plates – most tourist signs are also in german. whilst most tourist options are closed, we get an idea that this place must buzz with activity and even more tourists and traffic in summer! 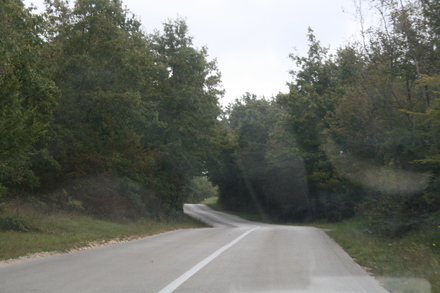 for us however, driving through croatia in october is a very relaxing experience. 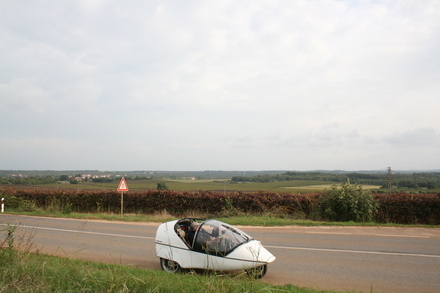 no traffic and many, many friendly people waving at the TWIKE. 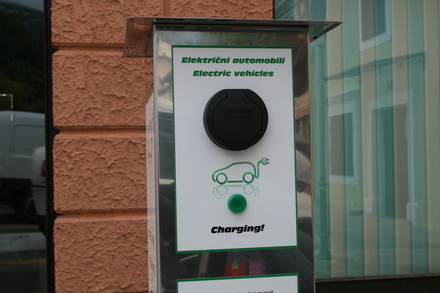 at the end of our first charge, we head to the port of vrsar and are greeted with an attractive selection of plugs from 6-64A – perfect! after asking around (and losing lots of time) we get one resounding answer from all the places we ask: NO CHARGING, GO AWAY! with only 9%/14kms in our battery, we head back to the only camping site close-by. arriving there, it turns out that the place had closed for the winter just days ago (5oct14). 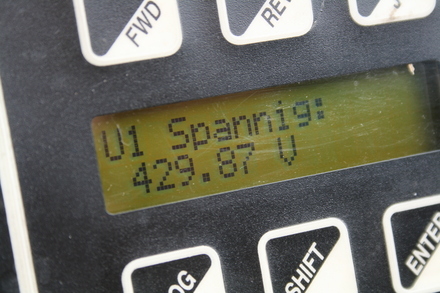 i sneaked in and checked the closest electricity distribution point and … it was active! back in business, we set-up our charging gear to charge at 26A using 2 cables (although set to 26A, you might spot in the video that TW560 was temporarily charging at 29A). one cable was charging at 19A instead of the rated 10A. before watching the video below, please read the stern disclaimer i added to the video and HEED THE WARNINGS! 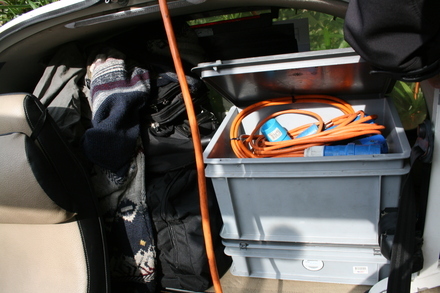 in this video we creatively source a charge for our EV at a camping site closed for winter. we *do not* condone charging without asking the owner of a plug first. this was an emergency charge after asking and driving to many other plugs! furthermore, charging at 190% of the rated power is not advisable and should not be understood as the norm. 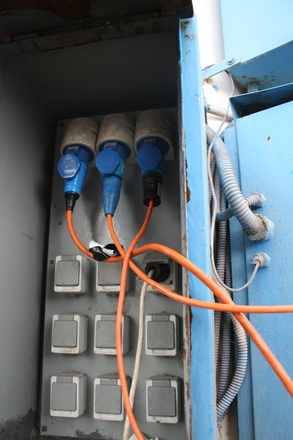 please learn about the consequences overloading electrical equipment can have BEFORE YOU CHARGE: fire, lethal shocks, live cables exposing due to excessive heat, death hazards, etc.! 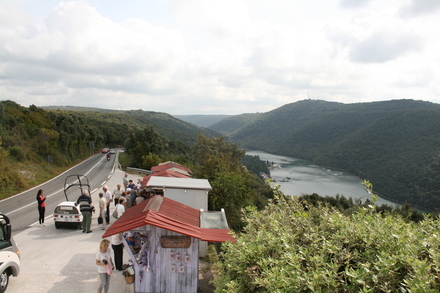 we head along our route through central croatia and randomly come by some kind of tourist spot where busloads of (rude || non-german) pensioners are dumped to see a valley with a river and are told to generously buy from the handful of stalls with lots of tacky souvenirs. i knew rakija before and there is a music video that nicely sums up the role of this drink in a balkan context. 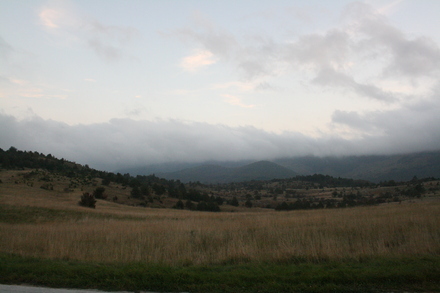 also, many of the images of this video look like the landscapes we crossed through later on this day. 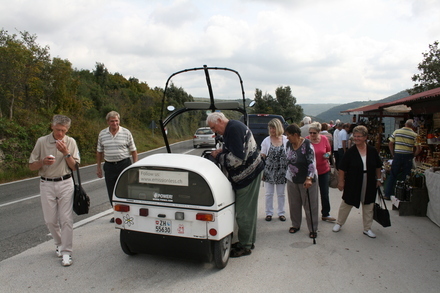 it is difficult to describe the basic amenities the people in rural croatia have – they look and are happy. 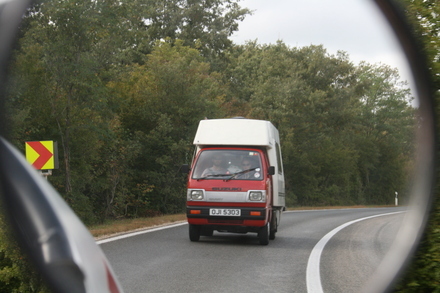 just like the brits we saw on with a miniature camper van – reduce to the MAX! 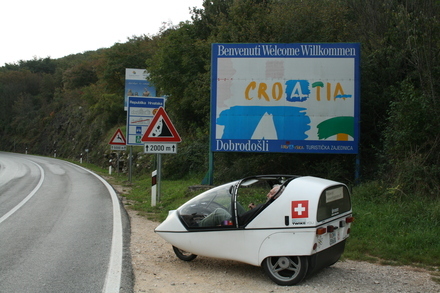 for us, used to the population density of switzerland, driving through rural croatia was a special experience. for kilometres on end no buildings, no infrastructure, no fields – nothing! 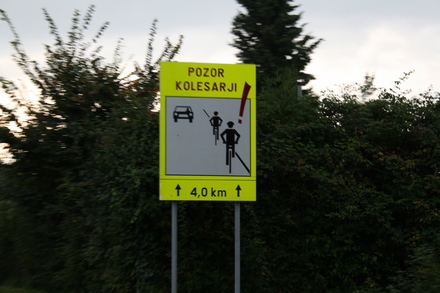 just a road and some signs to small villages. 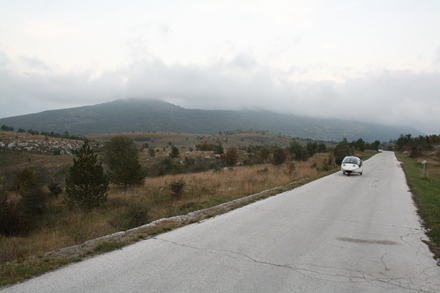 rural croatia – endless roads, no people. 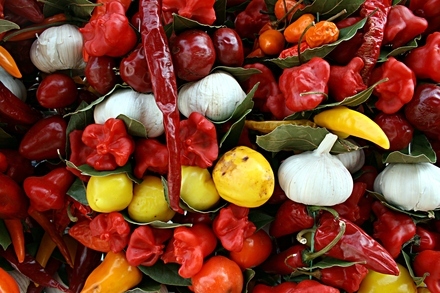 if you feel like joining us for some minutes in rural croatia, watch this video. get into the groove and overcome your 15 sec attention span before you pause the video again! 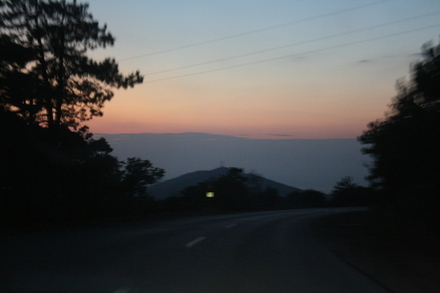 we enjoyed hours of this kind of road! we reach the coast and are treated to an exceptional view. as mentioned in the intro: this is exactily how it looked, no photoshopping required! wow. it’s as unreal as it looks. 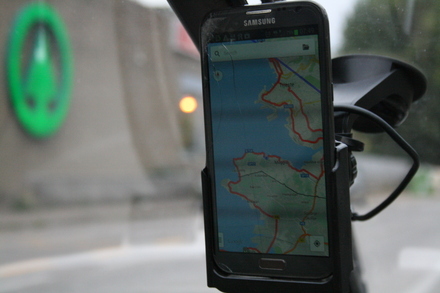 our second objective of TDM2014 is in reach: rijeka. 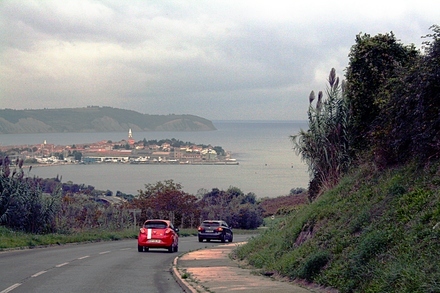 our road along the coast is dotted with stunning vistas and is definitely worth a second visit! 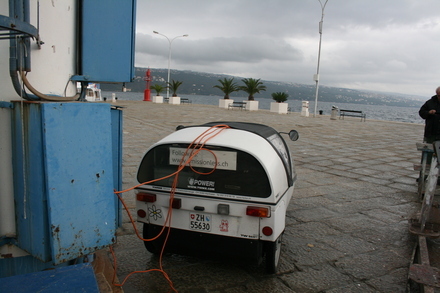 TW560’s charge is going to be about 11% when we reach the northernmost point – this is why when we reach lovran and see some signs for an electric car charging point, we’re more than interested! energy is for free and there is none of the nfc card nonsense required to get the electricity flowing. however, the place is disappointing because the maximum power provided by the plug is 3.7kW on just one phase. aargh! onwards we press towards our second goal for this trip. we cannot stop at the northernmost point itself but just beside it. the red dot marks the point. it feels good to have achieved this second of three challenges for TDM2014. 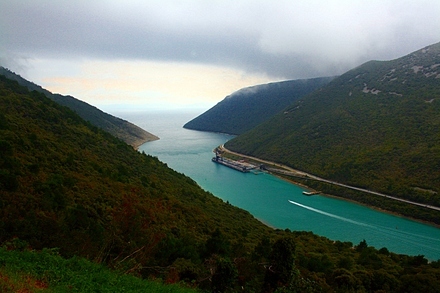 the port of opatja is our best bet for easy electricity – arriving there, we are very happy to see the same 10-64A selection as earlier today. the plugs are deactivated and it takes us some time to find someone to ask. the answers we get are simple but dishartening: today is a national holiday. 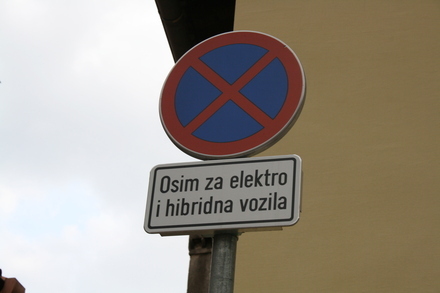 (this explains why we saw so many closed shops) and although they would like to offer us some electricity the person with the keys for the tri-phase plugs would be back only tomorrow morning… why not stay in opatja for the night they asked. a very good idea – it’s a really nice place. 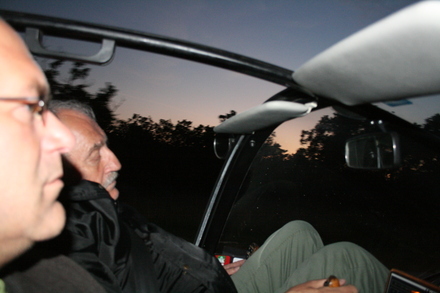 but for us with many more kms and adventures awaiting us, unfortunately, not an option. tadaa! we’re back in business! we settle in for a full 75 minute recharge from 4% to 100% since we will be climbing from sea level to a plateau at 700m. 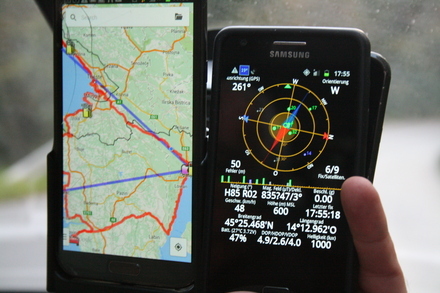 the charge is uneventful and we start out climbing the mountains which start directly at the sea in rijeka. the roads are extremely steep and TW560 had a really hard time getting up some of the roads! 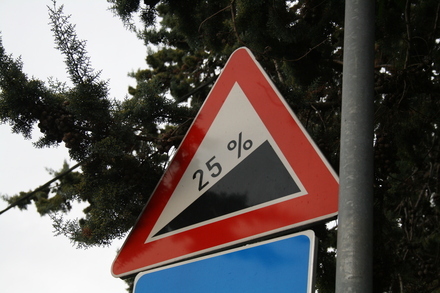 don’t ever think about stopping on the way up! 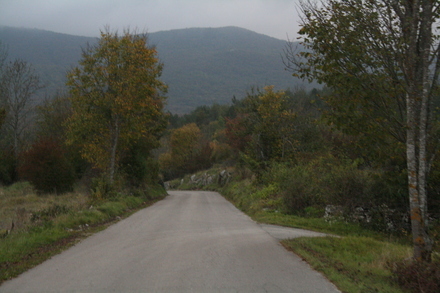 what follows is a taste of seriously dedicated twiking – rural croatia on our usual single road diet – and the end of the road…or is it? 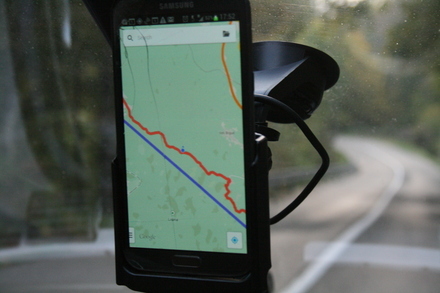 when preparing these trips, i usually check the satellite images for TWIKE-driveability – this patch somehow escaped my scrutiny. we press onwards after double checking and ascertaining that this part is only about 1 km long. we felt like in india with TW560 rattling, squeaking and groaning under our weight and lumbering along at 3-4 kms/h. we made it to the other end and were rewarded with a beautiful climb towards 700m exactly along our blue line. 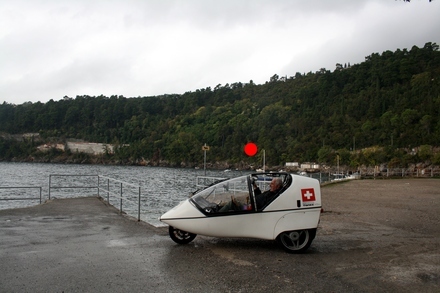 our answer: we decided to press onwards and try to make it on one charge. 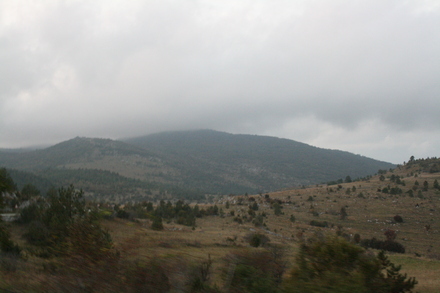 this plateau turned out to be mostly devoid of any kind of infrastructure and population. 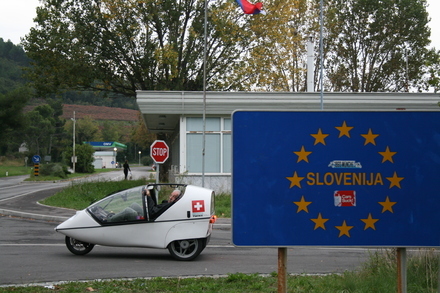 dozens of kms driving through non-arable land and forests with the slovenian border closing in from both sides along the mountain ridges. just before the border crossing to slovenia, we’re at 750m and the surroundings feel distinctly alpine. they could be anywhere in switzerland at around 1500m. we have no clue, why the place had such an impact on us. 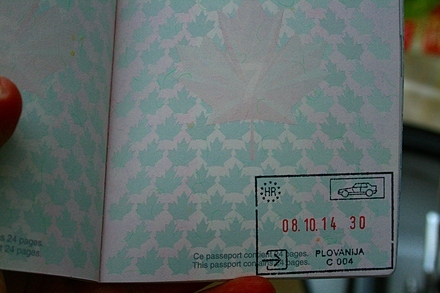 just a few kms onwards, i get a second stamp in my passport from a good looking croatian border control lady. 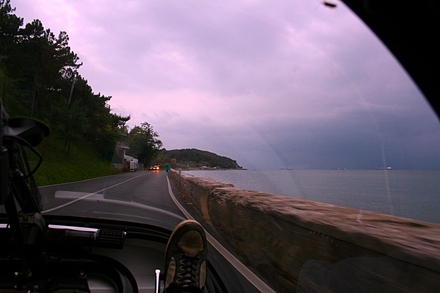 in slovenia, the sun slowly set and by the time we arrived back in italy, the last rays of sun were coloring the sky in dark shades of purple, blue and grey. ah. 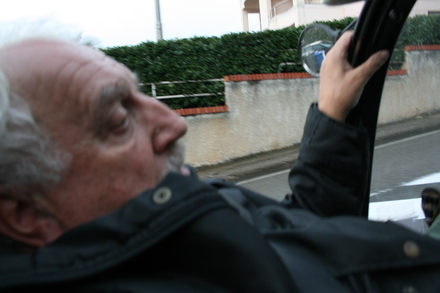 yes, we made it on one charge: we arrived at our hotel on the northern outskirts of triest with 17% left. what a day! wouldn’t want to miss it for anything in the world!